A nearly unlimited number of designs are possible for your ochs und junior, and you have tremendous potential to make Ludwig Oechslin’s watches your own. Your design tools are exactly the same ones we use here in Lucerne (perpetual calendar, annual calendar, moon phase, date, two time zones), and you can browse 10 years of thought posts to serve as the inspiration for your personal ochs und junior. This is not the only value we offer though. Cofounder Beat Weinmann, who serves as ochs und junior’s head of production, sales and service, will be your personal guide throughout the entire design process. Weinmann has the experience and aesthetic sensibility to guide you, and it would be his pleasure to discuss your personal watch with you. If you choose to set up a phone call with Weinmann, and you can have the ochs und junior website open during the call, you can interactively discuss the design for your watch like you were here in Lucerne. Through Weinmann, you have access to the talents of the ochs und junior team. Marion Müller is a master watchmaker with decades of experience in restoring fine timepieces and prototyping. Sandra Flück has become the recognized expert in patination. The writer has developed blue patina, as well as designed annual calendar LIGHT, the titanium perpetual calendar, and moon phase blue patina. Ludwig Oechslin contributes his ideas through his radical prototypes. Since we exclusively sell directly, and manufacture just about 130 watches per year, you will have our team’s full attention on your personal watch. This post is useful if you would like to independently explore the possibilities for your ochs und junior before you contact us. It covers four questions which we have found can help you identify your personal design. It also illustrates one possibility for customization through photos of a perpetual calendar which we recently manufactured for a client in Hong Kong. Details for this watch can be found at the bottom of this page. Before we begin, we would like to clarify two points. First, at any time you can simply contact Beat Weinmann with a question, and it would be his pleasure to answer you directly. It’s not necessary to think through these four questions before getting in touch. Second, it is only necessary to customize your personal ochs und junior if this is an opportunity that appeals to you. Our team has already designed several executions for each of Ludwig Oechslin’s five functions which can be found on the “Store” pages (example: perpetual calendar). These watches are individually-manufactured exactly like our custom-made watches. And a selection is always ready to ship immediately via FedEx from our workshop in Lucerne. 1. Which function are you interested in? Our homepage goes straight to the point and provides a concise overview of Ludwig Oechslin’s five functions. Here are a few further thoughts to help you decide which function is right for you. The perpetual calendar is the simplest calendar watch on the market to set. It comes in a unique case with slightly softer curves than the other 4 functions, and it is built upon the Ulysse Nardin UN-118 base movement. The annual calendar is perhaps the best example of Oechslin’s “rigorously simple” approach to watch design, and it’s available in more sizes than the perpetual calendar (42mm, 39mm, or 36mm) due to the smaller diameter of its base movement, the ETA 2824-2. 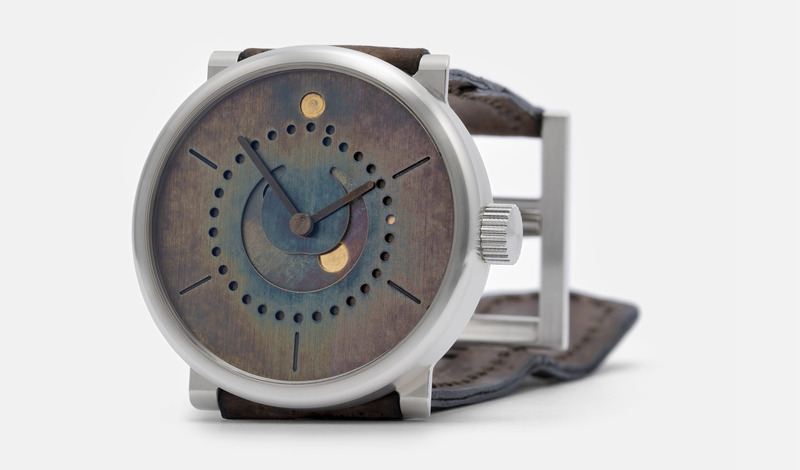 We believe this is the most thoughtfully-reduced (inside and out) calendar watch on the market. Oechslin’s moon phase watch features an epicyclic gear system which enables its moon phase calculation to be precise for 3’478.27 years despite being executed in just 5 parts. It is the most romantic function which we offer, and it represents a modern interpretation of the moon phase function. The date watch is Oechslin’s most minimalist watch – it shows the essentials in a carefully considered visual hierarchy: first the time, and then the date. Finally, the two time zones watch is the exception that proves the rule. It is the only ochs und junior with numbers. It offers the joy (and romance) of recognizing two time zones on one hand in a single glance. 2. What size would you like? Once you have decided upon your function, the next question is: what size? We offer the perpetual calendar in 42mm. This is the minimum possible case size which can house the Ulysse Nardin UN-118 base movement. The perpetual calendar wears small for a 42mm watch due to its very short integrated lugs which extend just a fraction of a millimeter beyond the radius of the bezel. Upon special request, we could manufacture the perpetual calendar in larger sizes: we once made one in 47mm. For the annual calendar, moon phase, date and two time zones watches, we offer two primary sizes: 42mm and 39mm. Both sizes are exceptionally comfortable to wear. Since both sizes work for any wrist size, this choice is more a question of whether you would like your watch to have a more subtle presence on your wrist (39mm), or if you would like to go for a bit sportier look (42mm). About 60% of our customers choose 42mm. If you have access to a printer, you can compare the 39mm and 42mm sizes on your wrist. The “Print 1:1” feature of our customizer tools allows you to print both sizes out life-size. Just make sure you print the page at “100%”. By default, some web browsers print with a setting called “Fit to page”, which can affect the scale of your print out. We can also manufacture the annual calendar, moon phase, date and two time zones watches in 36mm upon special request. We have done this just a couple times. Most of our customers who prefer a watch with a subtler wrist presence are very pleased with the proportions of the 39mm edition. Since the lugs on Oechslin’s case design do not extend beyond the radius of the bezel (this can be seen clearly in this post: Solid case backs), the 39mm edition wears like some 37mm-38mm watches. The 36mm edition is not an option we offer in our customization tools. 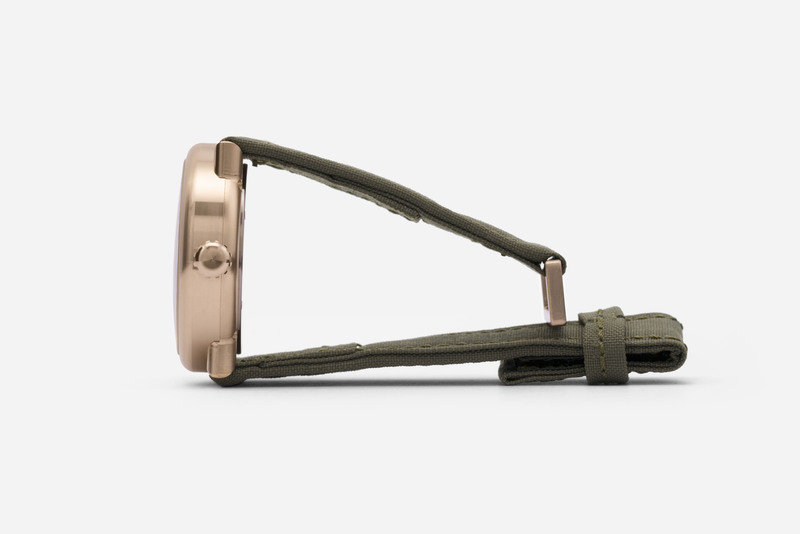 If you would like to have a 36mm edition, we recommend using the customizer to create a 39mm edition. After you have placed your order, we will create a technical diagram for you which shows your watch in 36mm. At that time, you could decide if you would like to stick with the 36mm edition, or to go with the 39mm. The height of the case is the same, regardless of the diameter (11mm for the annual calendar and moon phase, 10.4mm for the date and two time zones). Further details about Oechslin’s case are available on the “Facts” page for each function. 3. Which material would you prefer for your case, crown and buckle? After deciding upon your function and case size, the next important question is which material you would like to have for your case, crown and buckle. Here we offer two primary options: grade 5 titanium, and sterling silver 925. 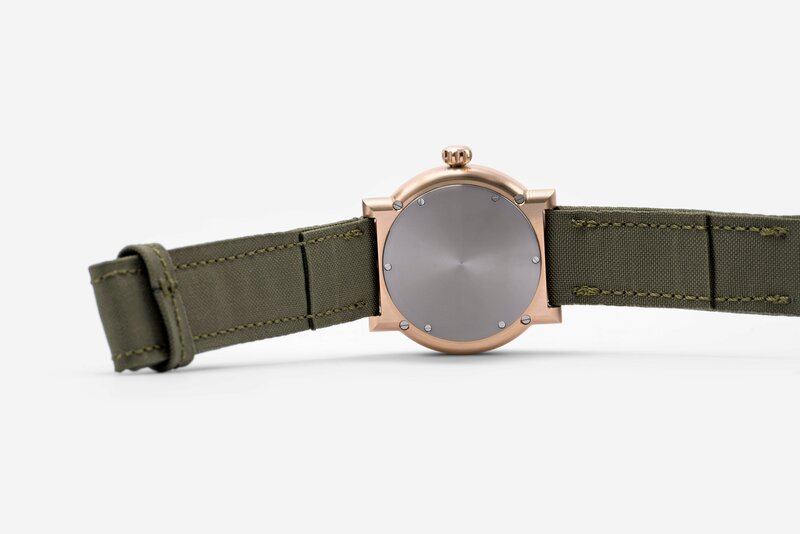 Titanium is probably the most functional case material for a watch. It is completely hypoallergenic, relatively lightweight, and exceptionally robust. It is grayer than sterling silver in color. An option for titanium parts which we started offering in 2016 is a PVD-coating. This coating gives your external parts an even, smokey gray color, and also makes them 15-20% more scratch resistant. Additional materials, like the bronze case featured in this post, are available upon request. There will be additional costs involved, as research and development can be required to reach the right result, and some materials are more expensive to work with. Precious metal watches are several times the price of our primary offerings, because your parts would be directly machined by Peter Cantieni or Helfenstein out of solid blocks of precious metal, instead of manufactured with a mold, the way precious metal watches made in series are manufactured. 4. Color, or pure metal? 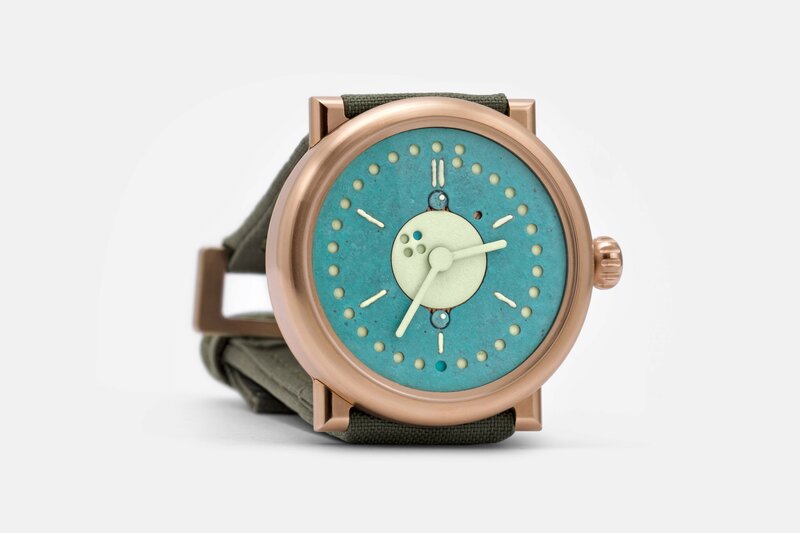 The last step is to design your dial. There are two broad paths for designing your dial. The first is to employ color. Using color can lead to a highly unique and personal design. A second benefit of color is that Super-LumiNova can be mixed with paint, which will allow you to read the time in total darkness. In theory we could add Super-LumiNova to any color paint. In practice, it makes the most sense to add Super-LumiNova to lighter colors like yellow and orange, because the lighter the color, the better its luminosity in the dark. For maximum visibility of the time in the dark, we would recommend white. There are a couple different ways to approach color. First, you could use color to achieve a highly functional result like annual calendar LIGHT by pairing a dark dial with light colored hands and markers. Alternatively, you could incorporate your favorite colors in a combination which matches your personal taste. The colors in our customizer tool form a family, so you can be confident of achieving a harmonious result when combining several of them. Here is an example of a colorful date watch which we recently manufactured. It is also possible to order personal colors which are not in the customizer. For this, you can simply share the colors you would like to have with us via a photo or Pantone values. 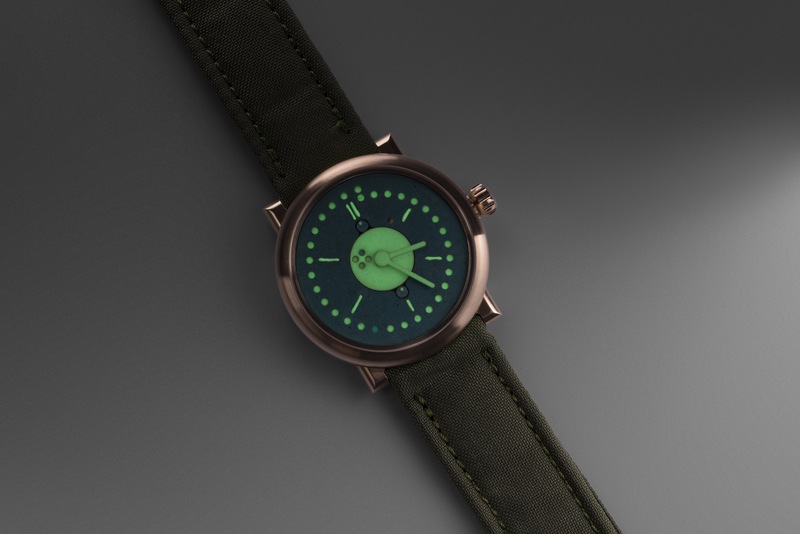 An example of a watch made with personal colors can be found in this thought post from 29. May 2015. Please see the section below called “Outside the customizer” for further information about this possibility. The second broad path for your dial is “pure metal”. Pure metal dials are elegant and timeless. A unique possibility offered by ochs und junior is patination. We patinate parts entirely by hand and the outcome is always unique. No color is added during the patination process. The appearance of the raw metal is transformed through oxidation into gray, blue, green (nebra), red, and even a rainbow of colors. To create contrast, you can combine patination with milling. Inside the low-oxygen environment of your watch case, further oxidation will occur very slowly. You can be confident that you will not perceive a significant change. A slight change over time is part of the charm of choosing patination – you are selecting a process which is “alive”. At your request, this additional patination could be reversed when your watch was serviced. If you would like to have the look of raw metal, but would prefer a perfectly uniform result, a PVD coating is also a possibility for your dial. You can see an example of a gray PVD dial in the perpetual calendar store. The dial’s appearance is very similar to gray patination, but is perfectly even. Finally, you can also combine patinated elements with color elements. For example, you could combine Super-LumiNova painted hands that allow you to read the time in the dark, with a patinated dial that has a lot of character. 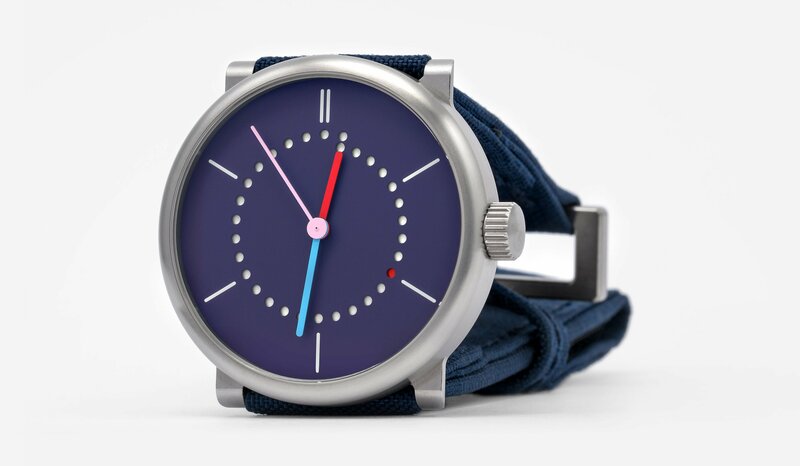 If you would like one of these executions, but with certain changes – for example, the titanium perpetual calendar execution, but with differently colored hands and dots – you can mock this up in our customizer tool by selecting options which are similar to what you would like to have. For example, to represent titanium, you could select German silver. 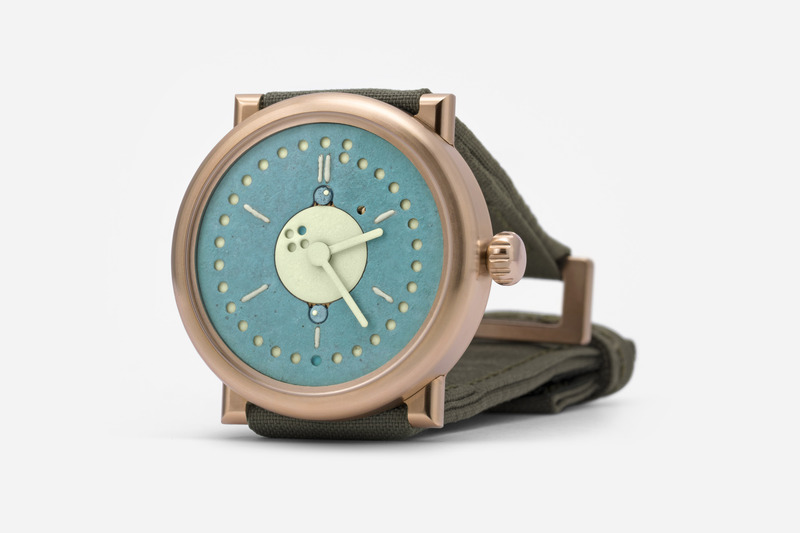 You could then finish designing your watch in the customizer tool and save it. When you email Beat Weinmann your design, you can simply inform him that the German silver parts are meant to represent titanium ones. We can also create custom Photoshop mockups for you if the design you have in mind is not possible in our customizer tool. Creating these mockups requires time and resources, so we ask for a confirmed order and an upfront payment before doing so. A “confirmed order” does not mean that the details for your watch have been decided, but that you are committing to purchasing an ochs und junior. We will send you a secure payment link for half of the base cost of the ochs und junior you are considering, after which we can proceed with creating one or more custom Photoshop mockups for you. Further information about payments can be found on the Purchase page. Put text or a logo on the dial – an ochs und junior has no logo. Manufacture a “display” case back – you can read our reasons in this thought post: Solid case backs. If you receive your watch and would like to change a detail, we will do this work free of charge for up to 30 days after you have received your watch. We will give you our FedEx number so you can ship your watch back to us very quickly at no charge. If you would like to change the look of your watch at any point in the future – perhaps because you have seen a new possibility on our website, or just because your tastes have changed – this is possible as well. You can find prices for this work on our Service page. To bring this post full circle, a few final points about the special perpetual calendar pictured in it. We manufactured this watch for a longtime client of ours who lives in Hong Kong. The client started in the customizer tool. Here is what he sent us: Customizer design. In his email, the client explained that he would like to have the design above, but in a bronze case. He had discovered the possibility for a bronze case on our Honored page. Since bronze can cause allergic reactions, we manufacture bronze cases with a titanium case back, as can be seen in the photos. This was an excellent example of how the customizer can be used. You can come as close as possible to the watch you would like to have in the tool, and then incorporate ideas you have been inspired by on other pages of our website. We wish you a lot of pleasure in the customization process, and look forward to hearing from you!